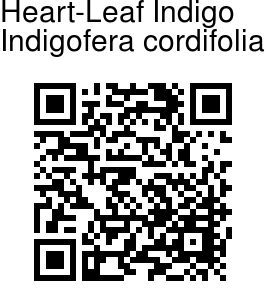 Heart-Leaf Indigo is a prostrate annual herb, with branched, velvet-hairy stem, 8 to 15 cm. Unlike many other Indigofera species, this plant has simple leaves, to 6-16 mm long, 4-13 mm broad, nearly stalkless, broadly ovate, heart-shaped, obtuse tipped, ending in a sharp point. Leaves are velvet-hairy on both sides. Inflorescence is a nearly stalkless, 4-8 flowered head. 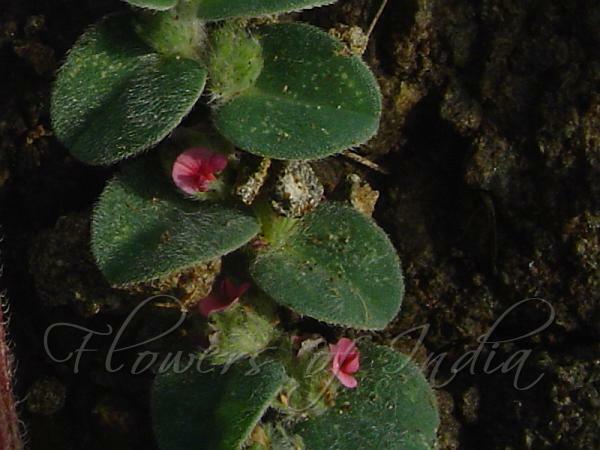 Sepal tube is 3-3.5 mm long, hairy; sepals linear, densely hairy. Flowers bright red, pea-shaped. Fruit 4-5 mm long, oblong, densely pubescent, 2-seeded, rarely 1-seeded. Flowering: August-October.